Tony Danza – Chazz Palminteri Celebrate All Things Italian! | Love Productions Inc.
Tony Danza – Chazz Palminteri Celebrate All Things Italian! The 11-day event runs from Thursday, September 14 through Sunday, September 24, and is expected to attract more than one-million people. 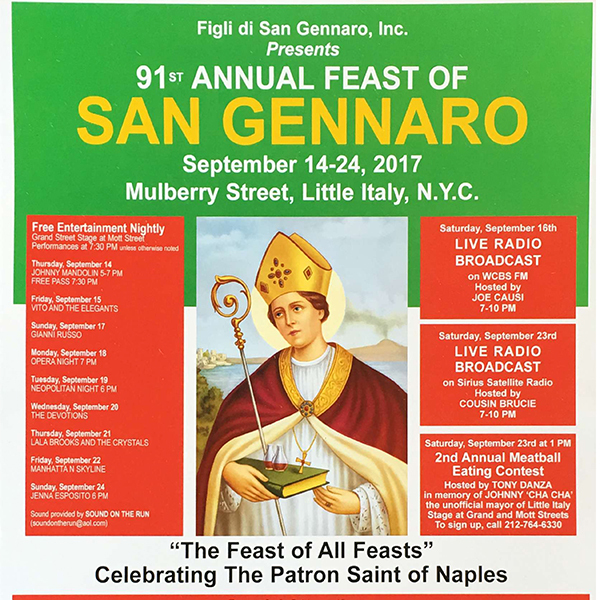 Each day there are various events scheduled, from the Grand Procession on Saturday, September 16 which features floats and marching bands (Chazz Palminteri is this year’s Grand Marshal), as well as free music and entertainment nightly. Two major eating competitions will be taking place: first on Friday, September 15 there is the Annual Cannoli Eating Competition at 2:00pm; and then on Saturday, September 23 there will be the Second Annual Meatball Eating Contest, hosted by Tony Danza, starting at 1:00pm.